John Keats lived only twenty-five years and four months (1795-1821), yet his poetic achievement is extraordinary. His writing career lasted a little more than five years (1814-1820), and three of his great odes--"Ode to a Nightingale," "Ode on a Grecian Urn," and "Ode on Melancholy"--were written in one month. Most of his major poems were written between his twenty-third and twenty-fourth years, and all his poems were written by his twenty-fifth year. In this brief period, he produced poems that rank him as one of the great English poets. He also wrote letters which T.S. Eliot calls "the most notable and the most important ever written by any English poet." With the twentieth century, the perception of Keats's poetry expanded; he was and is praised for his seriousness and thoughfulness, for his dealing with difficult human conflicts and artistic issues, and for his impassioned mental pursuit of truth. Keats advocated living "the ripest, fullest experience that one is capable of"; he believed that what determines truth is experience ("axioms are not axioms until they are proved upon our pulses"). The publication of Keats's letters, with their keen intellectional questioning and concern with moral and artistic problems, contributed to this re-assessment. His letters throw light on his own poetic practices and provide insight into writing in general. Click here for excerpts from Keats's letters. Keats belonged to a literary movement called romanticism. Romantic poets, because of their theories of literature and life, were drawn to lyric poetry; they even developed a new form of ode, often called the romantic meditative ode. The literary critic Jack Stillinger describes the typical movement of the romantic ode: The poet, unhappy with the real world, escapes or attempts to escape into the ideal. Disappointed in his mental flight, he returns to the real world. Usually he returns because human beings cannot live in the ideal or because he has not found what he was seeking. But the experience changes his understanding of his situation, of the world, etc. ; his views/feelings at the end of the poem differ significantly from those he held at the beginning of the poem. Douglas Bush noted that "Keats's important poems are related to, or grow directly out of...inner conflicts." For example, pain and pleasure are intertwined in "Ode to a Nightingale" and "Ode on a Grecian Urn"; love is intertwined with pain, and pleasure is intertwined with death in "La Belle Dame Sans Merci," "The Eve of St. Agnes," and "Isabella; or, the Pot of Basil." Cleanth Brooks defines the paradox that is the theme of "Ode to a Nightingale" somewhat differently: "the world of imagination offers a release from the painful world of actuality, yet at the same time it renders the world of actuality more painful by contrast." 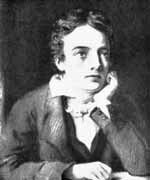 Keats often associated love and pain both in his life and in his poetry. He wrote of a young woman he found attactive, "When she comes into a room she makes an impression the same as the Beauty of a Leopardess.... I should like her to ruin me..." Love and death are intertwined in "Isabella; or, the Pot of Basil," "Bright Star," "The Eve of St. Agnes," and "La Belle Dame sans Merci." The Fatal Woman (the woman whom it is destructive to love, like Salome, Lilith, and Cleopatra) appears in "La Belle Dame sans Merci" and "Lamia." Identity is an issue in his view of the poet and for the dreamers in his odes (e.g., "Ode to a Nightingale") and narrative poems. Of the poetic character, he says, "... it is not itself--it has no self--it is every thing and nothing--it has no character--it enjoys light and shade--it lives in gusto, be it foul or fair, high or low, right or poor, mean or elevated..." He calls the poet "chameleon." Beyond the uncompromising sense that we are completely physical in a physical world, and the allied realization that we are compelled to imagine more than we can know or understand, there is a third quality in Keats more clearly present than in any other poet since Shakespeare. This is the gift of tragic acceptance, which persuades us that Keats was the least solipsistic of poets, the one most able to grasp the individuality and reality of selves totally distinct from his own, and of an outward world that would survive his perception of it. They believe that Keats came to accept this world, the here and now, as the ultimate value. a persistent kind of experience which dominated Keats's feelings, attitudes, and thoughts during that time. Each of them is a unique experience, but each of them is also, as it were, a facet of a larger experience. This larger experience is an intense awareness of both the joy and pain, the happiness and the sorrow, of human life. This awareness is feeling and becomes also thought, a kind of brooding as the poet sees them in others and feels them in himself. This awareness is not only feeling; it becomes also thought, a kind of brooding contemplation of the lot of human beings, who must satisfy their desire for happiness in a world where joy and pain are inevitably and inextricably tied together. This union of joy and pain is the fundamental fact of human experience that Keats has observed and accepted as true. In "Ode to a Nightingale" and "Ode on a Grecian Urn," Keats tries to free himself from the world of change by identifying with the nightingale, representing nature, or the urn, representing art. These odes, as well as "The Ode to Psyche" and the "Ode to Melancholy," present the poet as dreamer; the question in these odes, as well as in "La Belle Dame Sans Merci" and "The Eve of St. Agnes," is how Keats characterizes the dream or vision. Is it a positive experience which enriches the dreamer? or is it a negative experience which has the potential to cut off the dreamer from the real world and destroy him? What happens to the dreamers who do not awaken from the dream or do not awaken soon enough? Keats's imagery ranges among all our physical sensations: sight, hearing, taste, touch, smell, temperature, weight, pressure, hunger, thirst, sexuality, and movement. Keats repeatedly combines different senses in one image, that is, he attributes the trait(s) of one sense to another, a practice called synaesthesia. His synaesthetic imagery performs two major functions in his poems: it is part of their sensual effect, and the combining of senses normally experienced as separate suggests an underlying unity of dissimilar happenings, the oneness of all forms of life. Richard H. Fogle calls these images the product of his "unrivaled ability to absorb, sympathize with, and humanize natural objects." Here the poet TASTES the visual ("Flora and the country green"), activity ("Dance"), sound ("Provencal song"), and mood or pleasure ("mirth"); also the visual ("sunburnt") is combined with a pleasurable emotional state ("mirth"). With the beaker there is finally something to taste, but what is being tasted is temperature ("warm") and a location ("South"). Combines sight ("light") with touch/movement ("breezes blown"). This image describes light filtering through leaves moved by the wind. Combines touch ("soft"), weight ("hangs"), and smell ("incense). Combines vision ("silver," the color of the trumpets) and sound (trumpets produce a "silver" sound). "Isabella; or, The Pot of Gold"
Now it's your turn. What three sensory experiences are combined in this line? Keats's poems have appealed to artists and illustrators, particularly from the 1840's through the 1930s. Three poems have received the most attention--Endymion, Isabella; or, the Pot of Basil, and The Eve of St. Agnes. According to Richard Altick, at least twenty paintings and illustrations have been made of each of these poems. Keats's appeal for painters and illustrators is a tribute to how vivid and sensual his imagery is and how his poems stimuate the imagination of his readers. There are other reasons why painters and illustrators were drawn to him: he wrote about art and artists and was friendly with many artists; also the publication of his collected works in 1840 and of a biography in 1848 aroused a general interest in Keats and helped to establish his position as one of England's greatest poets. As a Web project, Renzo Roblodowski illustrated three of Keats's poems, drew Keats listening to a nightingale in the garden of his friend Brown, and also made a drawing of Ophelia. They are mounted as thumbnails in an art gallery on this Website. To view his illustrations full size, click on the thumbnail or on the filename underneath the thumbnail in Renzo's Art Gallery. List of Keats links, including the Keats List. List of major events and writings, by year.